As the the game clock ran down in Oklahoma City, Tim Duncan put his head down in sorrow and the San Antonio Spurs 67 win season came to an end by the hands of Kevin Durant and Russell Westbrook. The Oklahoma City Thunder advanced to the Western Conference Finals and Father Time remained undefeated. This may have been the last basketball game for Tim Duncan and Manu Ginobili. These two legends have been everything to the city of San Antonio. Five NBA Championships and some of the most beautiful team basketball I have ever seen. 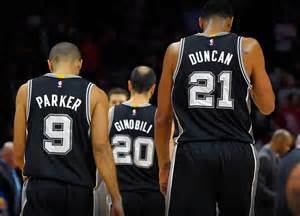 The big three (Duncan, Ginobili, and Parker) have been a thorn in my side for years. As an Oklahoma City Thunder fan I am not too fond of the Spurs, but I most certainly respect them. If this is indeed the end for Duncan and Ginobili, I just want to say thank you for what you guys have done for the great game of basketball. The end of this era may be coming, but they sure have left their legacy on the game. This entry was posted in NBA and tagged Kevin Durant, Manu Ginobili, NBA Playoffs, OKC Thunder, Russell Westbrook, San Antonio Spurs, Tim Duncan, Tony Parker by just1mike. Bookmark the permalink.